Tina and Olivia have turned down the opportunity to share a boat with me and departed for a days shopping in nearby villages of Hathersage and Bamford. 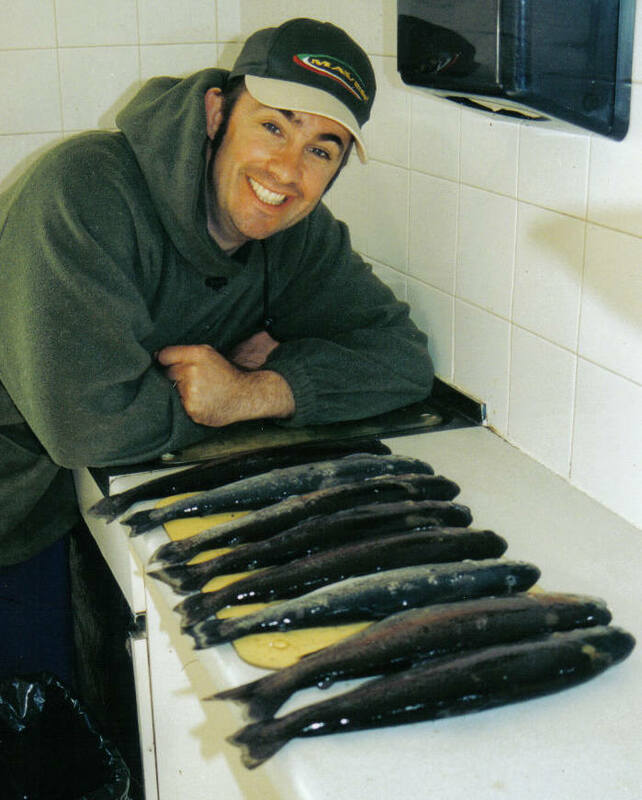 The walls of the ticket office have an assortment of clippings and pictures and one that always stands out is the one of Tag Barns holding a beautiful trout of double figures. 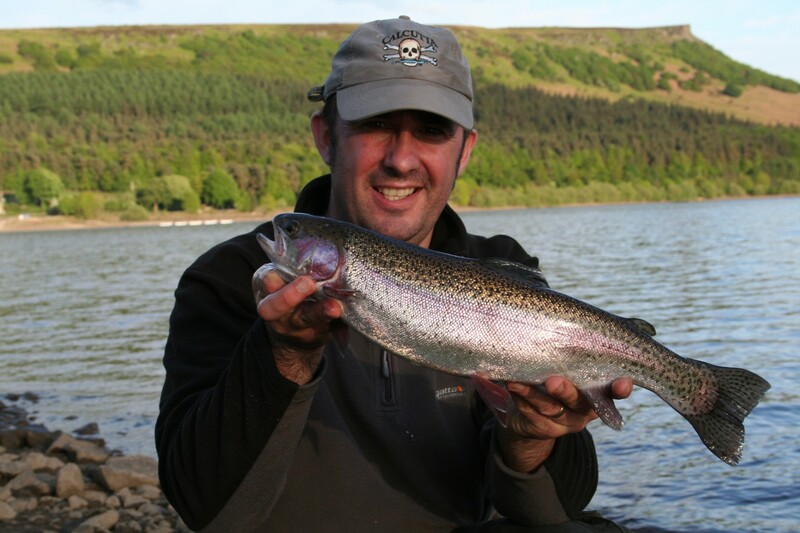 I buy a day ticket and hire a boat for the day, at the same time denying myself a choice from the selection of trout flies on offer, even though the waggytails look deadly if not one for the purist. Down onto the jetty and it’s now that the scale of the water hits me, this is no commercial bagging venue, it even dwarves the near by Dam Flask, making it look little more than a kiddies paddling pool! 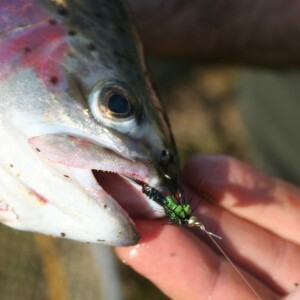 Into the boat I go, this is always an exiting time for me, I love the boating part of trout fishing. Firstly I like to get everything stowed away neatly and at hand then onto the rowing seat to adjust the foot rest so that my legs have plenty of room, my rowing technique is very upper body orientated and the rests serve only as rests rather than leverage points for lower body power. The perfect recipe for tired shoulders a bad back and stiff arms but the only serious exercise I will get this week so I masochistically look forward to the punishment! The boat is released from the jetty and I am away, for some reason I have always been good at the casting off bit and the coming into dock parts, I have seen others who have almost written half a dozen boats off before they have gotten a few feet from the bank! A bit like those old Greek boats with the fat bloke and a drum, “Ramming speed! Boom bang boom bang!” just take it steady, ease the boat out with gentle mini strokes, there’s enough time to make an arse of yourself once out of site, no point everyone thinking you’re a complete “spacker” to start off with. Once away from the jetty the oar strokes can become more purposeful and the prow of the boat begins to make steady headway into the wilder open waters, once well out from the dangers of the bank (I would hate to take somebody out with a weighted nymph doing 80mph) I begin to fish, casting the fly and allowing the boat to drift, occasionally taking to the oars and heading off to favourite spots along the arms or towards the dam wall. 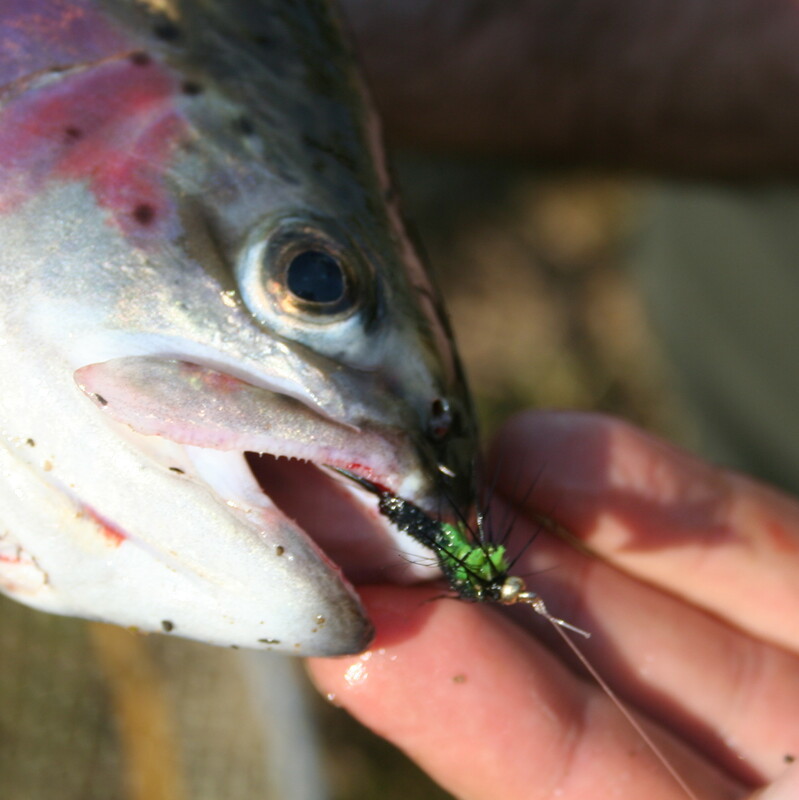 Today was to be a good day for fly fishing as in I was actually catching fish from the off rather than thrashing away like a whirling dervish for nothing! The white and orange polystickle I chose to begin with soon accounted for a nice brace of larger than average stock fish and prompted me to take to the oars before I quickly limited myself off the water. Tina wouldn’t be back till three thirty and hours spent idling around waiting for her return would be no fun and may well end in me drinking more than my fair share in the nearby public houses, drunk and in possession of two brace of dead fish now that wouldn’t do at all, would it! So most of the day was be spent on the drift and searching out new parts of this massive water, not wanting to limit myself away too quickly and it was time well spent as I found several beautiful spots away from the well fished areas and finishing my limit was no problem at all, as I turned the boat around and headed back towards the shore I left feeling better and filled with a little more confidence about fly fishing than when I had arrived that morning. Whilst I was gutting my fish in the drying room I met a couple of chaps from Manchester, they too had had a good days sport, having a double ticket each now that makes for a lot of gutting! Sport was definatly on the up as last season I and quite a few others had struggled to get a brace never mind easily doing our limits. Happy days to come on the Ladybower this year if this is anything to go by! It is way too easy Lee, plastic fish and all that.